Kefir is a yogurt-like lacto-fermented beverage with a slightly fizzy taste that is made from kefir grains. It has thirty times more probiotic cultures than yogurt including lactobacillus, acidophilus and bifidobacteria. Kefir’s live yeast and bacteria cultures can colonize in the intestinal tract to control and eliminate destructive pathogenic microorganisms and increase good bacteria and micro-flora. The kefir-making Yahoo Group has over 3,000 members who post regularly on the subject. This is an excellent resource that will help you find kefir grains. If grains need to be mailed, they will survive in a double-Ziploc baggie with a small amount of milk for two-to-three days. The Yahoo group members usually do not expect payment but they will need to be reimbursed for postage. When your grains arrive, immediately transfer them to a glass jar and add one cup of milk (Note: the milk can be cold). The lid should be loosely fitted. Place the jar on a shelf or your counter at room temperature. Swirl the jar at five second intervals whenever possible. Swirling breaks up the grains and exposes more surfaces to lactose. Grains multiply at a rate of 10 percent per day in the summer and 5 percent per day in the winter. Approximately 24 hours after you have started your kefir, your product will be very thick. It may start to separate into curds and whey. As the grains multiply, fermentation will accelerate. 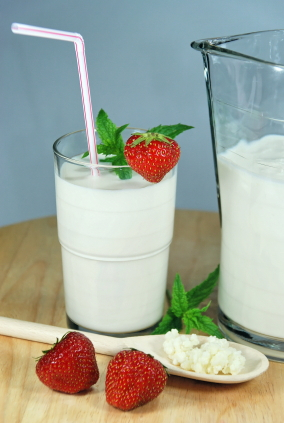 You’ll want to strain your kefir when you see a separation beginning to take place. Use the spatula or wooden spoon to push your grains into a clean jar to start a new batch. Do not place grains into a jar that is warm from a dishwasher. Store finished kefir in the refrigerator and enjoy! To store your grains, they may be covered with milk and placed in the refrigerator to hibernate. Make sure to change the milk at least once a week, and don’t let them hibernate for a prolonged period of time. To slow down your kefir add more milk or remove some of your grains. You can eat the grains or give them away to a friend.